2015 has been a splendid musical year, even if, politically, it has often been catastrophic. As my previous posting showed, the ninetieth birthday of Pierre Boulez has loomed large, and it does here too. It could readily have loomed still larger here, but I tried to offer, in this list of twenty performances, something of a cross-section. There were a good few other performances worthy of mention, but I had to stop somewhere; having failed to keep the list down to last year’s twelve, twenty was just about possible. The year began with a mesmerising Wigmore Hall recital from Jonas Kaufmann and Helmut Deutsch. Kaufmann might be indulging in some ill-advised populist activity – why? he can hardly need the money – but he remains a superlative artist, not just in opera, but also in Lieder. London’s and indeed the world’s greatest chamber venue also played host to a dazzling recital of Cardew and Rzewski from Igor Levit; if that was not great pianism, then I do not know what is. An equally captivating programme of Haydn, Ravel, and Schumann, from the Quatuor Ebène and Mitsuko Uchida, rounds off my three Wigmore selections. Returning to song, but in another venue – I like to think of Vienna’s Konzerthaus as my Wigmore Hall abroad – Christian Gerhaher’s ‘Wiener Schule’ recital proved well-nigh perfect: performances as exalted as the programming. Barbara Hannigan is a performer who seems to inspire the highest praise in everyone, without exception. Her concert (as singer and conductor) of Haydn, Mozart, and Stravinsky, with the Britten Sinfonia would surely have been a highlight in anyone’s year. Schumann featured in both the Kaufmann and Ebène programmes; he was the sole composer in an unforgettable – with these artists, how could it be otherwise? – Musikverein concert from Murray Perahia, the Chamber Orchestra of Europe and Bernard Haitink. Haitink may or may not be the greatest living conductor; he has few serious rivals. One of them, however, would unquestionably be Daniel Barenboim, who features heavily in this list. His Vienna Philharmonic Mahler Ninth doubtless moved all the more, coming as it did in the wake of the Paris attacks, but this was an astounding performance by any standards. Both Barenboim and Haitink offered memorable Schubert Ninths too, but if pushed to choose, I should – perhaps more out of temperament than anything else – opt for Barenboim, again with the Vienna Philharmonic, prefaced by equally fine performances of works by Boulez. Boulez’s Dérive 2 had long been a work I had struggled to understand; finally, the penny dropped with a performance from Barenboim and his West-Eastern Divan musicians. The Tchaikovsky Fourth Symphony, which completed that Salzburg WEDO programme, proved, in its very different way, just as great a performance. That leaves us with opera: again a fine year indeed. Waltraud Meier as Isolde would have left no one disappointed; Peter Konwitschny’s Munich staging of Tristan, provocative in the best sense, was, her reported scepticism notwithstanding, a fine setting for this distinguished artist to bid one of her greatest roles farewell. Barenboim conducted a world-beating cast in Dmitri Tcherniakov’s brilliant ‘post-Herheim’ Parsifal. There is so much to say on that front that I think it best simply to refer to you to my initial review; however, I cannot resist intoning the name ‘Andreas Schager’. Moving across Berlin from the Staatsoper, still in its Schillertheater exile, to the Komische Oper, Calixto Bieito’s Easter Sunday (!) double bill of Gianni Schicchi and Bluebeard’s Castle hit spots that few directors would even suspect existed. Ausrine Stundyte’s Judit was, quite simply, a revelation. Since the death of Sir Colin Davis, I had almost begun to despair about the possibilities of hearing a Mozart opera convincingly conducted again. There are a (very) few exceptions to the general Mozartian malaise: Barenboim and Muti, for instance. To their exclusive club, we should now add Jane Glover, at the helm for a sparkling Royal Academy Opera Figaro, whose memory I shall long treasure. I shall be astonished if we do not hear more, much more, in the near future from many of the young singers at the Hackney Empire. 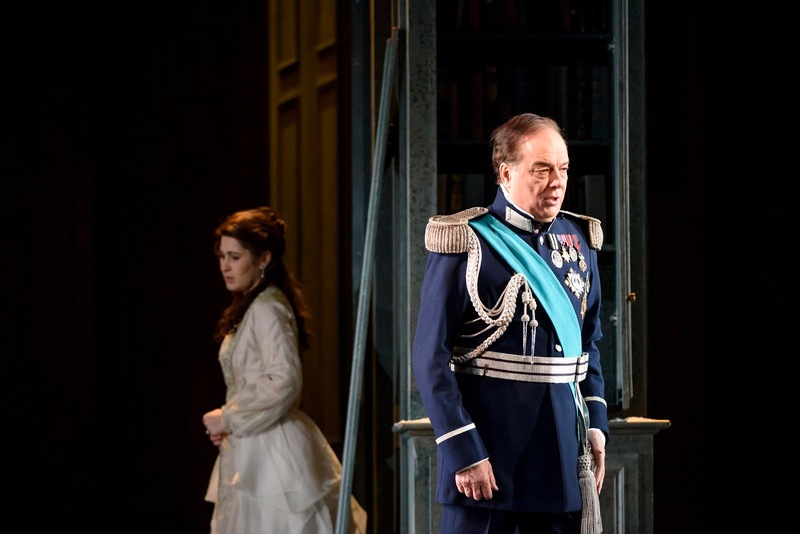 Opera Holland Park goes from strength to strength in repertory works too: Il trittico was perhaps the finest performance I have yet heard there. Contemporary opera fared well, insofar as our companies permitted it to do so. 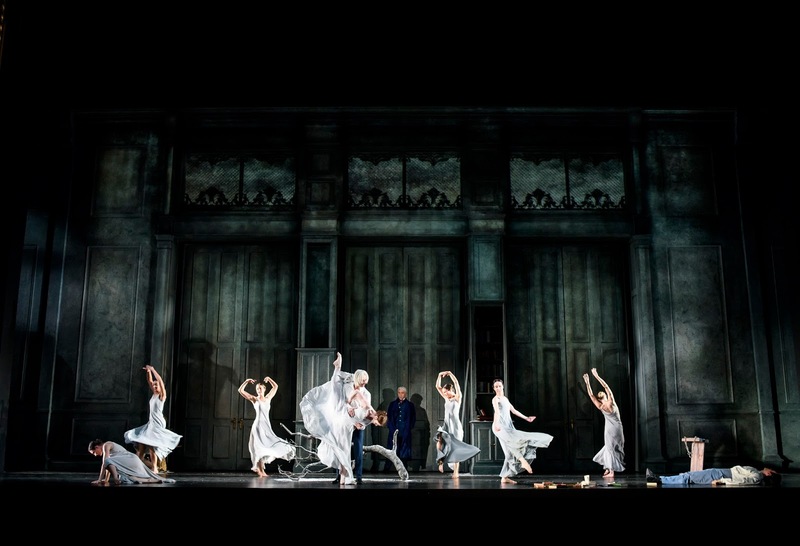 ‘Outstanding in pretty much every way – just what an opera house should be doing, in this case in collaboration with Aldeburgh and the London Sinfonietta,’ was the opening of my review of Birtwistle’s The Cure and The Corridor at the Royal Opera House. If Kurtág’s Beckett opera was yet again postponed – so it has been for 2016 – there was impressive compensation in Salzburg’s staging (Konwitschny again) of Rihm’s Die Eroberung von Mexico. Schoenberg still sometimes finds himself – absurdly – filed under ‘contemporary’. His ‘difficulty’ is more an ideological claim, of course, than a reality. All one needs to do – admittedly too much for some – is listen. Stéphane Lissner’s new regime at the Paris Opéra opened with a bang, with Romeo Castellucci’s new staging of Moses und Aron. The contrast, not only between this and the benighted intendancy of Nicolas Joël, but between Lissner’s programme for the whole year and that of his predecessor, offers true hope that Paris might recapture the spirit of Gerard Mortier: a cheering thought with which to approach 2016. My 2015 concert calendar opened with Schumann, courtesy of Jonas Kaufmann, and closed with Schumann. It also opened and closed at the Wigmore Hall. The Modigliani Quartet, joined by Beatrice Rana, offered a fascinating selection of chamber music from 1842, starting with the A major String Quartet, op.41 no.3. The first movement’s echo – surely a conscious tribute? – of Beethoven’s op.31 no.3 Piano Sonata was clear. Sadness, however, differentiated it. What followed was Romantically developed, that sadness never, quite rightly, being entirely banished. The players offered a glowing Romantic tone: no fashionable withdrawal of vibrato or other expressive parsimony here. What we heard was, at times, short-breathed, but in a positive sense; so is Schumann’s writing, or at least it can be. The unease of syncopation was quite disconcerting. There was, moreover, real pain to be heard during the development, especially from Laurent Marfaing’s viola and François Kieffer’s cello; this was not a performance to offer sacrifices upon the altar of ‘mere’ beauty. Indeed, in some ways, this sounded a later work than it actually is. That sense of trouble persisted with the syncopations of the second movement. Bachian counterpoint seemed almost to win out over the Beethovenian tendencies still stronger in the preceding movement, but truly Schumannesque ‘character’ eventually called into question such easy typologies. It was difficult, though, not to experience a haunting from the world of Schubert and Death and the Maiden. Classical restraint returned (more or less) in the slow movement, perhaps closer to Schumann’s celebrated, if wrong-headed, conception of Mozart. It sang, though, and the path upon which it proceeded was very much Schumann’s own. This was an ‘involved’ performance in the best senses, burdened and liberated by cross-rhythms. The finale sounded, quite rightly, as if possessed by an aspirant skittishness which could not quite become the real, or at least the unmediated, thing. This was a Haydnesque ‘as if…’. Energy and physicality were here very much the hallmark of the Modigliani Quartet’s performance. Philippe Bernhard left the stage for the Piano Quartet, the remaining trio joined by Beatrice Rana. I was not quite so convinced by her contribution, which often sounded a little reticent, although there was nothing in particular to complain about either. At any rate, the introduction to the first movement sounded full of potential, not unlike that to a Haydn symphony. And indeed, Schumann’s Classical inheritance here sounded much stronger throughout much of the movement, indeed the work. He is, perhaps, less enigmatic here, although the work is certainly not without its mysteries. The scherzo was taken very fast, yet without sounding in the least unduly driven. Mendelssohn, the quartet’s dedicatee, seemed present, albeit darkened, more troubled. The slow movement offered straining after Beethovenian sublimity, the music again finding an alternative, compelling way. Here, the ‘as if…’ was more Mozartian. Melody was heart-rendingly enthroned, yet never quite secure in that enthronement: the performance was all the more touching for it. Virtuosic high spirits came to the fore, at least sometimes, in the finale: what string playing this was! After the interval, we heard all five players in the Piano Quintet. Earlier this month, I heard a very fine performance from the Quatuor Ebène and Mitsuko Uchida; at the time, I lamented that we did not hear this work more often. ‘Maybe “we” do,’ I added, ‘and I have just been unfortunate in missing out on performances.’ Indeed! This performance had little to fear from comparisons with its exalted predecessor. Rana’s playing gained in character, and if it could hardly be said to rank with that of Uchida’s, then we should remind ourselves that music-making is not, or should not be, a competition. On its own terms, there was much to enjoy, and the Modigliani players were excellent indeed. The first movement was forthright yet flexible. ‘Soloists’ from the strings were probably more Romantically yielding than their Ebène counterparts; one ‘duet’ from viola and cello had one’s heart stop. Perhaps that was occasionally at the expense of the last degree of structural cohesion, but if so, the expense was slight. The second movement was characterised by interplay, indeed a dialectic, between the initial, Schubertian note of grim determination and melodic necessity. The strings offered Romantic – and romantic – intensity in an extremely powerful reading. Not for the first time, I found myself having to ‘backdate’ Brahmsian qualities. The scherzo was lively, goal-oriented, again without sounding hard-driven. Rana contributed some splendidly pellucid piano playing. Schumann’s finale benefited from playing that was similar – and yet, in context, different. There was a vehemence that Brahms would surely have admired, which yet, in the twinkling of an eye, transformed itself into something other. I am delighted to be able to toast this year's principal anniversary composer. as well as one of our hardiest of perennials. It has never not been Beethoven's time; now it is indisputably Boulez's time too. Perhaps more importantly still, I can point to a range of composer's music I have been able to hear over the year. Whatever silliness might be said about concert life dying and so forth, it is just silliness, nothing more. I have again counted the operatic performances I have attended this year. The following includes concert performances, but gives only one point per evening; Il trittico counts as one, then, but so does Gianni Schicchi. I am not sure what, if anything, this shows beyond what it immediately claims. It clearly reflects my interests but just as clearly, perhaps more so, reflects what has been available. A horrendous year politically, which, more than any other I can remember, cried out for a staging, indeed multiple stagings, of Nono's Intolleranza, had none; alas, I could not stamp my foot and have it be otherwise. 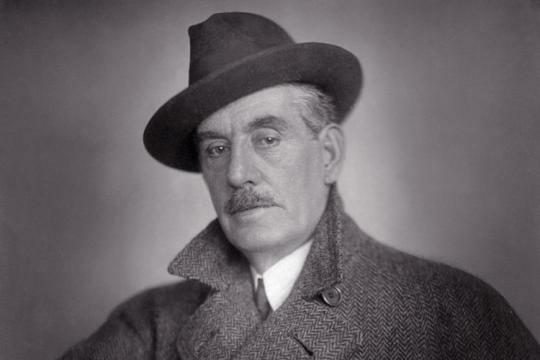 Puccini's ranking has, however, been most surprising to me over the past three years; it cannot be entirely explained by undoubted over-exposure from timid opera management. His companions, Mozart and Wagner, have remained identical. Strauss has come fourth, or joint fourth, in each of these years too. This was a decidedly superior, somewhat yet not excessively oblique, Advent/Christmas concert. Motets from Schütz’s 1648 Geistliche Chor-Musik, supplemented by a duet and an aria from the earlier (1639) Kleine Geistliche Konzerte II, framed the four parts of Christopher Fox’s Trostlieder (in Widerwärtigkeit des Kriegs), receiving its world premiere. Fox’s work is a cappella, whereas the Schütz pieces all have organ continuo; other than that, the forces are similar, Schütz writing for slightly different forces throughout his collection. The Schütz pieces offered some ‘seasonal’ quality, in perhaps a similar measure to Handel’s Messiah doing so. The connection with Fox’s new work, a response to James Weeks’s invitation to compose a companion work to some of Schütz’s motets, began yet did not end with 1648, a date burned onto the German and indeed the European conscience and memory, as the end of the Thirty Years’ War and its attendant, almost incredible devastation. Fox had come to know Schütz’s music in the early 1980s and ‘remembered from that time that Schütz makes a brief appearance in Günter Grass’s 1979 novel, Das Treffen in Telgte’. In his novel, Grass has a number of German writers meeting in the aftermath of the war, and, as an appendix, offers an anthology from those writers, including the first part of Martin Opitz’s Trost-Gedichte in Widwärtigkeit des Kriegs (‘Poems of Comfort in the Dreadfulness of War’), written earlier during the conflict. It may, or may not, be coincidental that Opitz was also the librettist for Schütz’s Dafne, the first German opera, whose music has, alas, been lost. At any rate, Fox has understandably felt parallels with both his own family’s history – the Red Army’s occupation of Pomerania echoing the destruction of three centuries earlier – and the plight of Syria today. They do not appear explicitly, or at least unmistakeably, in this work; we may have other, personal and/or societal, parallels to draw. The omnipresence of war, of state-sanctioned violence, and of the dislocation that refugees – from the Holy Family onwards, and indeed long before that – are unlikely, however, to leave our minds completely; they certainly did not mine. Toing and froing from 1648 (and a little earlier) to 2015 unsurprisingly shone light upon both similarity and difference; what was perhaps surprising was how much the former tended to prevail over the latter. The nature of the Geistliche Chor-Musik as a collection has musical parallels of its own; perhaps inevitably, I thought both of Monteverdi’s Selva morale e spirituale and the later practice, in so many genres, of Bach. Thinking of Schütz as the transalpine stepping-stone – I suppose ‘Pass’ might be better, given the terrain – between the glories of Venice and the absolute summit of Western music is ingrained upon our musico-historical consciousness, and with good reason. Had he not been Gabrieli’s pupil, we might have had to invent the fact. The opening Ein Kind ist uns geboren sounded poised between madrigalian sacred piece and the prima pratica, between homophony and counterpoint: both as work and as performance from EXAUDI under Weeks. Darkness and yet luminosity were the Advent hallmarks of Das Wort ward Fleisch, the celebrated opening of St John’s Gospel made musical flesh. And even if the sense of music travelling north from Venice to the German lands might sometimes be a little too fanciful, a little too convenient, here again it sounded in the setting of Luther’s translation of an Advent collect, O Lieber Herre Gott: mediated not only by the Reformation but by the shadow of war. The first of the four parts of Fox’s Trostlieder then followed. The composer’s own description of this lengthy section of text reads: ‘“May my tongue burn with passion; let me not stumble on this barren path.” The war-torn landscape is described: farms abandoned, the land pillaged, homes on fire. “The sickle and plough have been sharpened into swords.”’ The harmonic language is, of course, quite different from that of Schütz; so are many other things. There sounded nevertheless a strong element of kinship, not least in the sorts of writing, such as outlined above, one might hear, whether more straightforwardly echoing those distinctions in Schütz’s music or reimagining them. It also struck me – and this may simply be my own personal resonance – that the way in which particular vocal lines would sometimes take a different turn from what one might have expected, without in the least sense sounding arbitrary, offered kinship with a composer who, rightly, or wrongly, has often been seen as marking the end of that tradition inaugurated by Schütz: Arnold Schoenberg. Cries of horror – ‘Ey, ey’ – proved especially, dramatically memorable. The quasi-muttering of some of the final section and the open musical and verbal question of the final line – ‘Wer fragt, ob Kriegeskunst List, oder Tugend sey?’ left one wanting more: both of Schütz and of Fox. Excellent performances throughout were, of course, part and parcel of that; it was perhaps more than usually difficult to separate works from their performance here. Schütz’s Ich bin jung gewesen und bin alt worden was sung by Simon Whiteley and Jimmy Holliday with disarming clarity and sincerity, resounding as a touching profession of faith, not least in its closing Allelujas. There followed the second part of Fox’s work: ‘A series of images of cyclical change in the natural world: the passage of sun and moon, night following day, changes in the weather. “This is the way of the world, one falls, another rises, one rises, another falls.”’ The varying textures and ‘solo’ spots somehow always sounded ‘right’, without my necessarily being able to tell you why. A case in point would be the placing of the countertenor on top in the third stanza ‘Zu Zeiten ligt die See gantz stille, glatt und eben, …’. Relative flatness – I speak not in terms of pitch, but of register: foothills, if you like, rather than peaks – in much, although not all, of this seemed to convey or at least to suggest a fatalism in the face of cyclical change, and perhaps also in the face of less natural transformations. And yet, I felt tempted to think, for ‘them’ and for ‘us’, things moved. After that, the precious sadness, interspersed with knowing, certainly not naïve, joy in what we might call salvation, sounded in Schütz’s Die mit Tränen säen. Restrained jubilation was also to be heard in Ich bin ein rechter Weinstock, that restraint partly a matter of what had gone before: historically, musically, and musico-historically. There seemed to be a little more overt passion in Schütz’s Herr, auf dich traue ich, whilst the hymnal quality of the ensuing So fah rich hin zu Jesus Christ, its simplicity and its complexity, pointed towards the future of German music. The third part of Trostlieder sounded perhaps more overtly strange in harmonic context, at least in its opening, repeated yet transformed, invocation. To quote Fox again, ‘Two different sets of text. Groups of two, then three, then four singers gradually introduce these words, an invocation against pride: … Between these sections the singers sing together, each singing their own passage of text.’ Such was what we heard, the singers making it sound so much easier than it can possibly have been, without that musical ease obscuring the musical dialectic. Holliday sang, again quite disarmingly, the solo aria, Ich liege und schlafe, reminding us once again of the more operatic elements of Schütz’s writing. Coming to the final part of Fox’s work, I reflected on what seemed to me to be the gratefulness of his vocal writing; that was certainly how EXAUDI made it sound. ‘“We are on our way again”: images of travel, the wind propelling our ship to shore. There is comfort in hope. “Life is like a house-guest, to be encouraged to stay,”, yet “life goes in only one direction”, to death.’ The interplay between cries of ‘O nein!’ and ‘Die Hoffnung,’ the hope to which Fox alludes, seems at the heart of this part to be both a verbal and a musico-structural concern. Much of the rest of the writing, leading us to death, participates in Schütz-like restraint, the homophony unmistakeable. And then: quiet, even radiant certainty in the three final Schütz motets, Unser keener lebet ihm selber, Selig sind die Toten, and Ich weiß, daß mein Erlöser lebt. That said, there was difference here too in similarity: the quietness ,the radiance different in quality on each occasion. The final musical flowering, again for us inevitably evoking Messiah (‘I know that my Redeemer liveth’) sounded properly, softly German, whilst acknowledging the Italianate roots from which it had clearly sprung. The first revival of Kasper Holten’s Royal Opera production of Eugene Onegin (reviewed here the first time around) brought one major advantage, undoubtedly worth the visit to Covent Garden alone, namely the conducting of Semyon Bychkov – and, of course, alongside that the playing of the Orchestra of the Royal Opera House. Vocally, it was for me far more of a mixed bag, although the audience seemed wildly enthusiastic. As for the staging itself, I was less convinced than last time. There remains a good deal to have one think – presumably that was the reason for the sadly predictable display from the house’s first-night animal-noises department – but the changes made, combined with lesser acting strength, above all in the title role, sometimes makes for a confusing evening dramatically. The central idea of memory is a good one; it is, after all, the work’s own. The bookish Tatyana receives her inspiration through recollection and the haunting of the present – or, at times, perhaps the future – by the central pair’s younger selves has considerable effect. It would have more, however, were there more dramatic commitment on Dmitri Hvorostovksy’s part; especially before the interval, he seemed content merely to stand and sing. Moreover, his ‘double’ lacks the charisma of Tatyana’s. 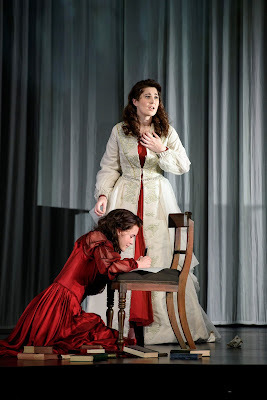 The production offers confusion of its own; it is, for example, unclear – and not, I think, in a productive fashion – why the elder Tatyana sings the Letter Scene to her younger self. Would it not make more sense if singers and ‘doubles’ swapped roles as appropriate (not the actual artists, of course, but they could surely don younger and older ‘appearance’ and costumes). Memory can play tricks, but I am not sure that is the point being made here; perhaps it is, and I missed it. More fundamentally, though, I felt more strongly than last time the loss of what is surely the underlying theme, even if involuntarily so on the composer’s part, of the opera. This is a staging whose heterosexuality would warm the heart of Vladimir Putin. Perhaps that allows greater agency on Tatyana’s part; I was especially intrigued by thinking of her writing her drama as a counterpart to the ‘masculine’ – and, rightly so, whatever the uncomprehending complaints one heard, often from people who know not their Prague from their Vienna – writing of Holten’s Don Giovanni. That is not strongly pursued, though, partly, I think, as a consequence of less dancing than first time around; the doubles are there enough to irritate, but not long enough now really to make their point fully coherent. That Tatyana is a creation of a gay man – and surely this screams from the score – there is no visual sign at all. More damagingly, though, the principal relationship in the opera, that between Onegin and Lensky, is merely that of the frightened surface. Of the homoeroticism that is less a subtext than the text of a non-ideological understanding of the work we again see nothing. So Lensky is merely jealous of Onegin’s ‘flirtation’ with Olga. That the truest and most deadly love is between the two men is entirely ignored: a retrograde step indeed. I do not think for one moment that this is intended in Russian Minister of Culture fashion, but the likes of Vladimir Medinsky would have little to argue with – which should give pause for thought. 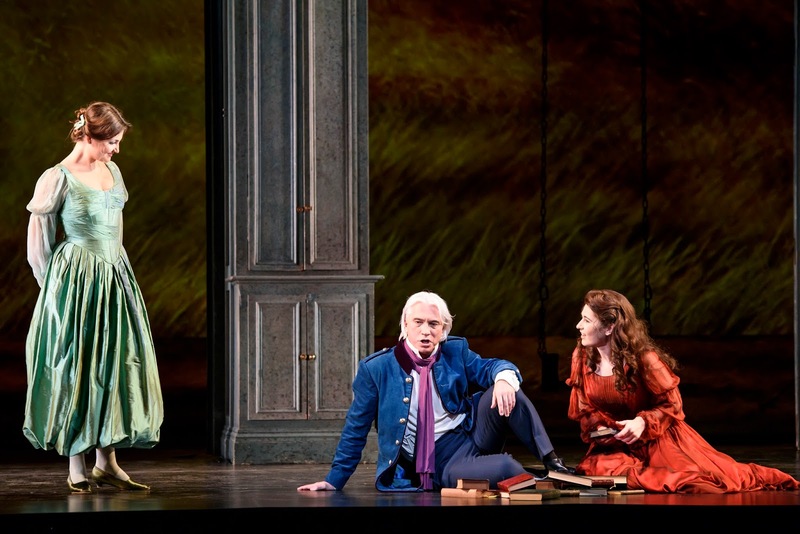 It is, then, perhaps a little unreasonable to complain that the singers play their roles in such a way, although I am sure that there was greater psychological depth in the relationship between Simon Keenlyside’s Onegin and Pavol Breslik’s Lensky. Hvorostovsky proved a little more engaged dramatically after the interval, but wooden indeed before, although, given his recent travails, it was impossible not to feel sympathy for him. His singing was often deeply impressive vocally, but that is not necessarily enough; memories of Keenlyside were too strong for me. Mine certainly seemed to be a minority view concerning Michael Fabiano’s Lensky; he received a roar of applause both at the end and – deplorably – during the fifth scene. I could not question Fabiano’s commitment, which put that of almost everyone else to shame. 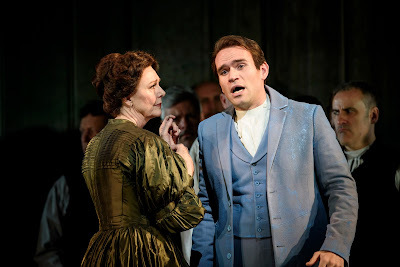 However, for me, the timbre and, more important, the emoting style of his performance did not quite sound ‘right’ for the work and the character, more suited perhaps to the world of Italian verismo. It was, I have to admit, a performance very much in keeping, though, with the heteronormativity of the production; this was, as I said, a committed performance – of a lovelorn young man distraught at the loss of his girl. Nicole Car offered an attractive soprano voice as Tatyana, and acted well too; I did not, though, find a great deal of insight beyond that. Memories of Krassimira Stoyanova, as with those of her Onegin, were not effaced. Oksana Volkova was a decent enough Olga, but again without any particular individuality. The stand-out performance was for me Jean-Paul Fouchécourt’s deliciously stylish Monsieur Triquet, sung with such perfect attention to words and line that I longed to hear it again. 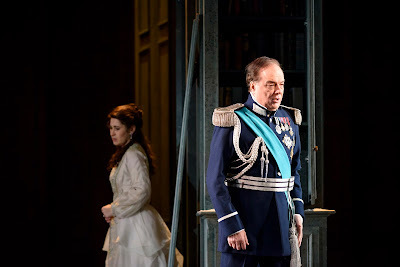 Ferruccio Furlanetto’s Prince Gremin was a little rough around the vocal edges at times, but still interesting to hear. Diana Montague as Mme Larina and Catherine Wyn Rogers as Filipyevna shone as last time. The choral singing was excellent too, save – and here some of the soloists were at fault too – for a few too many discrepancies between stage and pit. It was, however, as I started by saying, in the pit that the greatest honours lay. Bychkov had the orchestra sound – as it always does under him – as one of the greatest in the world, utterly responsive to his touch. The strings were febrile and warmly Romantic, the utter antithesis of any absurd ‘period’ affectations; the woodwind were as full of character as I have ever heard in this work. Implacable brass at full throttle might almost have been from St Petersburg. Rubato, especially the lingering at the end of phrases, was greater than one often hears, always with its own justification, always having one sit up and listen, both to savour the moment and to breathe out when the story resumed. Broader tempo variations were again well calculated, dramatically convincing. There was some breathtakingly soft playing – for instance, the ravishing sonic cushion for M. Triquet’s final lines – which could not have stood in greater, more tellingly intimate contrast with the Fatal climaxes. Bychkov understands what is and what is not ‘symphonic’ in Tchaikovsky’s score – and communicated it in what, Daniel Barenboim notwithstanding, is probably the best-conducted, certainly the most orchestrally variegated, performance of Eugene Onegin I have heard. This is perhaps a difficult easy recital to write about. With the best will in the world – and I think I probably have that when it comes to Waltraud Meier – not everything was entirely successful; or, perhaps better, there was little that approached the perfection one might expect from some artists. It is, I think, a little too easy to fall back on clichés concerning distinctions between ‘opera singers’ and Lieder singers. There are no absolute boundaries between artists; nor are there between genres. Indeed, there can be a certain snobbery when it comes to Lieder-singing, just as there can be when it comes to chamber music vis-à-vis orchestral music. Perhaps it is justified, sometimes at least; it is difficult to dispute that the general standard of works in the one is higher than in the other. Imagine a song repertoire that was mostly devoted to the likes of Verdi and Donizetti! In any case, that was not what we heard here, Mahler and, above all, Wagner being unsurprising territory for Meier. Kindertotenlieder received an interesting performance. Intonation was not always spot on. I think that element of colouring – a deliberate flatness? – was, like other such elements, sometimes an interpretative decision, quite striking; however, I am not convinced that it always was. Perhaps it was not the best work with which to have opened a recital; too often, Mahler’s vocal lines sounded dangerously exposed. Meier treated the songs, and here I realise that I am already falling back on the ‘operatic’ cliché, more as a unified drama than one generally hears. One might object that that is not what these songs ‘are’ and I suppose they are not, but it does no harm to hear different approaches. Certain phrase endings in particular had more musical connotations, sounding very much in the line of the Wagner heroines she has portrayed – and also, those one might have wished her to portray: Brünnhilde as well as Isolde. Joseph Breinl’s piano playing sounded spare, more contrapuntal than harmonic in emphasis. That, however, is how Mahler tends to sound on the piano. I am not convinced that Mahler’s songs, where orchestral versions exist, are best served by the piano; regardless of what actually came first, the ‘accompaniments’ sound as if conceived with something close to Klangfarbenmelodie in mind; one hears very much where Schoenberg and, perhaps still more so, Webern were coming from. But there is interest in hearing how different the harmonies sound shorn of their orchestral colour, and such comments are in no way meant as adverse criticism of Breinl’s excellent performances in any of the Mahler songs. In the second half, Meier seemed considerably more at ease with the composer. There was sardonicism and there was archly ‘staged’ flirtation in the Wunderhorn songs; these are songs of alienation, just as the Rückert-Lieder are, and that is how they sounded. The terrible stillness of ‘Um Mitternacht’ can rarely have sounded so threateningly Nietzschean. Both artists ensured that each of these songs had its own character and, again, the sense of some overarching narrative, even if it were one impossible to put into words, was strong. It was more akin to a cantata, almost Waltraute-like – I always think of that Götterdämmerung scene in such terms – than one generally hears, or would generally wish to, but again, there was much to be gleaned from such a perspective. For all that is often said about Wagner as a pianist, his later works involving piano are far from negligible. His Sonata for Mathilde Wesendonck is far too often ignorantly dismissed; it is a fascinating work, which deserves many more hearings. The songs which bear her name are rightly esteemed, of course; here what struck me, both intrinsically and in performance, was how genuinely song-like they are, their overt operatic connections notwithstanding. Breinl’s tone was softer, more conciliatory: more ‘Romantic’, I should say. 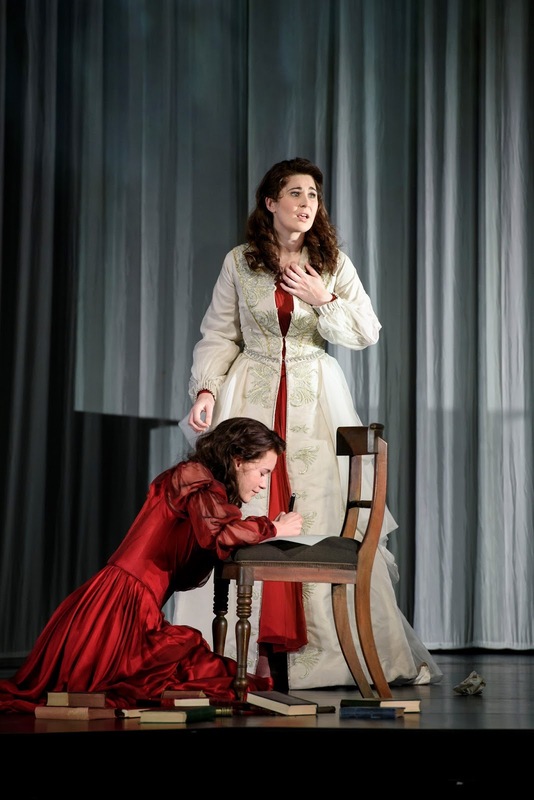 Meier offered a portrayal of wisdom that seemed almost to be recalling youthful folly: heard more from the standpoint of Isolde at her Transfiguration rather than in the second act. Echoes and indeed presentiments of Isolde are impossible to banish here, but this seemed to be more than that. Again, there was a starkly ‘dramatic’ aspect to the performance which I should not always wish to hear, but which I was glad to have heard on this occasion. The encores were worth the price of admission alone. About them I had no reservations whatsoever. First, we heard an urgent, almost overwhelming performance – from both artists – of Brahms’s Von ewiger Liebe. Then Meier astonished with the most terrifying Erlkönig I have ever heard and, most likely, shall ever hear. In her narrative and characterising element, this was in the very best sense an operatic scena, its terror heightened of course by Breinl’s command of that cruel piano part. Meier’s searing performance, though, was something I doubt I shall ever forget. So perhaps I was wrong to start by suggesting that this was a difficult recital to write about; one simply needed to take it on its own terms. Those terms often provided their own vindication, regardless of what might be considered ‘correct’. I have heard a good deal of moaning about Messiah performances this year: more, I have to say, from performers than from audiences. Perhaps it does become a little tedious for some; there are certainly alternatives (or why not supplementary works?) well worth exploring. Yet, for whatever this is worth, there generally seems to be an audience for a performance, of whatever ilk. Moreover, whilst I should love the opportunity to hear other Handel oratorios in non-‘period’ performances, they are few and far between. For those of us who admire Handel and prefer his music to be treated as music rather than pseudo-archaeology, we are not exactly spoilt for choice during the rest of the year. There was, for me at least, a little too much that betrayed ‘period’ influence here, more with respect to the orchestra than anything else. It was not so much that the instruments were compelled to play in evidence-free ‘period style’, or what passes for that, as that the strings of the tiny orchestra (3.2.2.2.1) rarely played out as it might have done, a familiar tale for those of us wearily accustomed to enduring so-called ‘historically-informed performances’ on modern instruments. The perversity of having modern instruments and yet being afraid to use them is something I shall never understand, save of course for fear of the fury Adorno so memorably outlined in his essay on Bach, warning, alas, largely unheeded of the ‘sectarian’ nature of Historismus. One could hardly avoid the suspicion, he argued, that the sole concern of Bach’s ‘devotees’ (Liebhaber) was to ensure that ‘no inauthentic dynamics, no modifications of tempo, no excessively large choirs and orchestra’ should be employed. Palpable was the potential fury, ‘lest any more humane impulse’ should become audible. As he pointed out earlier in his essay, the (presumed) ‘absolute’ sound of the eighteenth century – not at all, I might add, an eighteenth-century concept but rather a distorted product of nineteenth-century conceptions of ‘absolute music’ – was already in the early 1950s being falsely elevated to an exclusivist end in itself. Many do not even notice any more, if indeed they ever did. And so, whilst there were moments in which the orchestra roused itself to play thrillingly, it often sounded subdued, in spite of generally sensible – and varied – tempi being adopted by John Lubbock. (One exception, was a bizarrely fast ‘Surely He hath borne our griefs’, quite at odds with the words – and music.) The trumpet playing (Nick Thompson and Simon Gabriel), however, was excellent, as was Howard Moody’s organ continuo: rather too hyperactive for my taste – ‘All they that see Him laugh Him to scorn’ a case in point – but in some respects, making up for the timidity of the string playing. A few more desks and a little more courage in the fight against ‘authenticity’ would have been welcome, even in so forgiving an acoustic as that of St John’s, Smith Square. Four young singers all had something creditable to offer. There was a great deal of ornamentation to be heard, very much the fashion nowadays; I have nothing against it in principle, but wonder whether we might hear more of the ‘original’ prior to its ornamentation. Nardus Williams’s clear, bright soprano was not always so full-toned as one might have hoped for, but I suspect that it will develop further in that direction. Her singing was in any case disarmingly sincere, as indeed was that of all of the soloists. Eleanor Edmonds was at her best in ‘He was despised’; there, one might almost have taken her relative darkness of tone for that of a contralto. I liked also the real defiance, which I am tempted to call ‘operatic’, in the final ‘like a refiner’s fire’ of ‘But who may abide the day of his coming’. Chris Turner also adopted a dramatic mode of performance as tenor: mostly welcome, save for a too-frequent ‘sob’ in the voice, which veered towards sentimentality. To my ears, Morgan Pearse was the pick of the bunch. His had all the drama of any of the other performances, but with a more varied palette and a deeper understanding – and communication – of the words and their implications. I had no quibbles at all with his truly excellent performance. A decent sized chorus proved both agile and (relatively) weighty, equally adept in homophonic and contrapuntal music. If, on occasion, I thought Lubbock had OSJ Voices sing too fast and/or too blithely, that was not the fault of the chorus itself, clearly well-trained by Jeremy Jackman. Further performances will be given on 19th (Dorchester Abbey), 20th (SJE Arts, Oxford), and 21st December (Kings Place). Those on 20th and 21st are advertised as using Lubbock’s ‘new reorchestration for flutes, oboes, clarinets, bassoon, cello, bass, trumpets, timpani, and organ’. That sounds intriguing: definitely worth a hearing, I suspect. Cuts were made – there is, in any case, no definitive ‘version’ – but nothing too grievous. This was a strange concert programme, whose internal logic I found and continue to find difficult to fathom. The London Philharmonic was on excellent form throughout; otherwise, there was not much to unite these works. Moreover, Jaap van Zweden’s conducting of Beethoven’s Seventh Symphony, whilst starting promisingly, proved a decidedly mixed blessing. One can hardly begrudge a work more or less unknown an occasional outing, but I really cannot understand what would possess someone to conduct Johan Wagenaar’s Cyrano de Bergerac Overture. Its opening flourish is so clearly derivative of Don Juan, as are a good few other, strangely decontextualised progressions that Strauss would surely have had a case for plagiarism. Not that the piece, of course, in any sense approaches Strauss in quality. Stale bits of Brahms seem as though they are there to provide padding, but rarely succeed in doing so, at least coherently. It begins pleasantly enough, soon becoming merely tedious. The conductor’s irritating, sub-Bernstein podium manner did not help. Magnus Lindberg’s Second Violin Concerto benefited not only from fine playing from the LPO but quite stunning virtuosity from Frank Peter Zimmermann, not only in the cadenza but throughout. Zweden’s conducting, the visual element aside, could hardly be faulted either, insofar as I could tell. It certainly seemed that the composer received a true performance of the work. What of the work itself? In three movements, the first two of them connected without a break, its strongest point seemed to me to be its construction (something one could certainly not have said of Wagenaar’s piece). The opening solo, open fifths on the violin, is soon questioned by the orchestra. Intervals and their working out sound in this first movement strongly suggestive of Berg: there are worse models! Even towards the beginning, though, there is a stronger tonal pull. Orchestration is colourfully (post-)Romantic, sometimes, especially in its use of celesta and harp, strongly echoing composers such as Bartók and Prokofiev. Harmonies and indeed orchestration seem to become more and more overtly Romantic as the work progresses, at times edging, bizarrely to my ears, towards Khatchaturian (if rather more careful in its construction). There is a point in the final movement at which I thought the work had finished, but then it started again, moving ever closer to a Hollywood film score; there is more, much more, of the same to come. One passage sounds – I should like to say ironically, but I really am not sure – extremely close to the Waterfall in Strauss’s Alpine Symphony. I found myself longing for another performance of Boulez’s Anthèmes 2, such as I had heard in the same hall a few nights earlier. The first and second movements of the Beethoven symphony fared best. Above all, one could relish the full sound of a decent-sized, uninhibited symphony orchestra, an increasingly rare occurrence in this music. Violins were not split, but clarity was such that there was no overriding need for them to be. There was some splendid raucousness from the horns too. Quite what Zweden meant in a programme quotation saying ‘There are still people who play Beethoven like Brahms. And that I refuse to do,’ was unclear; I have never met someone who claimed to play Beethoven ‘like Brahms’, although I suspect the ‘authenticke’ brigade might have accused him here of doing just that. Rhythms in the first movement were nicely sprung, although the harmonically-founded inevitability of a great performance (think, for instance, of Daniel Barenboim) was lacking in an ultimately sectional reading. The exposition repeat, for instance, merely sounded as if we were starting again, unmotivated. Zweden took the Allegretto faster than I think I have ever heard it. Any element of a processional was banished, but there was a highly creditable command of line, which put me in mind of no less a conductor than Herbert von Karajan – albeit, if you can imagine so implausible a thing, Karajan in a rush to catch the last bus home. The LPO’s cultivated, variegated playing was a joy to listen to. Sadly, the third movement resembled a caricature of Karajan in less flattering light: one of those faceless, breathless Beethoven symphonic recordings from the 1970s. We were spared ‘authenticity’, but it did not seem that Zweden had anything to say. (The contrast with recent performances from Christoph von Dohnányi and Oliver Zeffman was stark.) There was grandeur to some elements of the Trio, but it was unclear where it had come from, or indeed where it went. If you were a Toscanini fan, I suppose you might have liked this. The finale was unsmiling in similar vein, but to a greater degree: quite absurdly hard-driven, despite unerringly fine orchestral playing. Zweden occasionally brought out subsidiary parts to no obvious end. It was, I am sorry to say, a bit of an ordeal. The Vienna Konzerthaus might, for a month, have become my new favoured hall – strictly, a house of more than one hall – but returning to the Wigmore Hall reminded me, just in case I needed reminding, that the Wigmore Hall not only stands as first among equals for chamber music; it is, simply, the best in the world. This programme from the Quatuor Ebène and Mitsuko Uchida would have offered a great attraction anywhere and certainly did in musically overflowing London, soon selling out; the resulting concert proved equally impressive. This was certainly one of the best performances of a Haydn quartet I have heard, constantly taking one by surprise – in the best way. The intriguing opening sonority – for which responsibility should be shared between composer and players: high cello singing above second violin and viola – sounded redolent of the old sonata di chiesa or still more venerable music for viol consort, but with the most modern of means, in itself a lesson for apostles of ‘authenticity’. This was never, thank God, a vibrato-free, or even vibrato-lite, zone. Out of such an opening, there blossomed full Classical tone and style. Counterpoint, of course, remained Janus-faced, generatively so. The rest of this extraordinary movement was both furious and complex, in work and performance. One needed to listen, and was finely rewarded when one did. The opening unison of the second movement ‘spoke’ almost like a recitativo acommpagnato, looking back to the late Baroque and sideways perhaps, even if coincidentally so, to Gluck, yet also looking forward, even pre-empting Beethoven. I thought of the slow movement to the Fourth Piano Concerto, Orpheus famously taming the furies. Transition to a more lyrical plane sounded somehow both fragile and secure – something, perhaps, to do with the relationship between melody and harmony – and again seemed to beckon toward the Romantic conception, right or wrong, of Beethoven having burst formal bonds. The fury of subsequent unison outbursts intensified such dialectical tension, preparing the way for different yet related dialectical ambiguities in the minuet (connected, of course, to its predecessor). Haydn, rightly, emerged as every bit as ‘difficult’ a composer as Brahms, Schoenberg, or, yes, Beethoven. The great tension built up, as great as anything in Beethoven, was worked out with a triumphant finale worthy of Haydn’s sometimes unhappy pupil. Yet there was also the intellectual nonchalance akin to late Mozart. The audacity of work and performance truly took my breath away. Magnificent! Ravel received a performance, which, if less surprising, was no less excellent. The players offered a more conventionally polished sound from the outset; one could hardly have – or wish to have – ‘unpolished’ Ravel. There was sheen aplenty for fury and placidity alike, as the composer surely demands. (Presumably somebody somewhere is claiming that any Ravel performance daring to show a little vibrato, a little beauty of tone, is an outright abomination, but who cares?) Subtle rubato emerged from the material rather than being imposed upon it. The scherzo thrilled, sparks duly, precisely, lovingly flying. Tenderness, though, lay at its heart. There was an almost Webern-like mystery to the slow movement, an inscrutability to the opening material and its development: seemingly unpredictable, even when one ‘knew’ it. This was not easy Ravel; nor should it have been. There was great sweetness but we also experienced great reticence and an almost Debussyan ambiguity: through, not in spite of, compositional and performative precision. The finale opened, seemingly hurtling towards the vortex, à ‘La Valse’¸taking with it material it recalled from before, but with progress as mysterious as that in the preceding movement. The Quatuor Ebène offered playing of a febrile intensity such as to attain true climax. Uchida added her famously pellucid piano tone and unforced, unshowy musicality to the ensemble for Schumann’s Piano Quintet. I really cannot understand why we do not hear this wonderful work more often; maybe ‘we’ do, and I have just been unfortunate in missing out on performances. The opening of the first movement was forthright yet melting, solo – by which, I do not just mean the piano – and ensemble playing equally tender. Schumann’s myriad of instrumental combinations were rendered wonderfully alive. Closeness to Brahms was both maintained and guarded against; this sounded ‘like’ no one other than Schumann, whatever connections presented themselves. Indeed, at some points, both here and in the second movement, it was Schubert and the Lied tradition that came to my mind, composer and performance seemingly constructing and deconstructing song before our ears. All, in a sense, were both songbirds and their grim hunters. Uchida maintained the harmonic basis for all that happened, as if playing for an instrumental Frauenliebe und -leben. The scherzo, by contrast, showed a strength of purpose which it was more or less impossible not to think of as Beethovenian, underlying even the relative relaxation of the first trio. Concision, both in work and performance, were certainly worthy of Beethoven, and it was difficult to avoid the sense of Schumann touching Brahms’s shoulder in the second trio. The exhilaration was such that we might almost already have heard our finale. That, of course, required something different, and received it, in what must surely be one of Schumann’s most creative responses to the ‘finale problem’. The music emerged in all its variegated glory and, at least as important, with all its emotional weight. Bachian lessons were learned – and returned with interest.